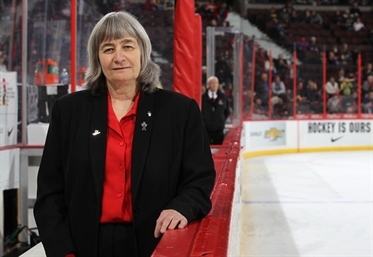 Fran Rider, Executive Director of the Ontario Women’s Hockey Association says Canadians are born with an interest in hockey. She came from a sports-minded family and started playing around 1967. When Rider was younger, she says there weren’t many opportunities for women to play hockey. They could watch the sport, but the playing was a different story. Currently, there is no professional women’s hockey like in basketball, football or hockey for men. The AA league is for recreation. The AAA team is national women’s hockey where the women travel and are in the Olympic Games. The Ontario Women’s Hockey Association was formed in 1975. When the association first started out they received support from Shoppers Drug Mart and Mississauga Mayor, Hazel McCallion. The International Ice Hockey Federation moved towards a full world championship in 1990 making it possible for Canadians to play in the Olympics. Rider also says diverse women playing hockey creates role models. “Angela [James] was one of the superstars by far and way ahead of her time,” Rider says. Angela James played for the Olympic women’s hockey team. She grew up in Flemingdon Park in Toronto. James is a Senior Sports Coordinator at Seneca College on York University’s campus. James, who lives with her partner, has three children. Chatting with her on a traditional hockey night in Canada, she reflected on the highlights of her hockey career. “The first world championship…the second world championship was another. The provincial championship was always a great highlight. There were so many it’s hard to say which one. The action on the ice, the way the game is played, the skating. It’s a winter sport, I enjoy that. Also friendship, it’s a team sport off the ice. James hasn’t decided yet whether she will be returning to hockey this year. For all of James’s success with hockey, she has recently been inducted into the Black Ice Hockey and Sports Hall of Fame based in Nova Scotia. Thank you for the Superbowl stream. I really appreciate it. My television from 1990 is safely in storage.